Figure 1. Ascochyta blight on garbanzo bean leaves. Figure 2. Ascochyta blight on garbanzo bean pods. Figure 3. Alfalfa mosaic virus in garbanzo beans. Figure 4. White mold on garbanzo bean stem. A pest control advisor recently contacted us to ask what pests he should be scouting for in garbanzo beans. His clients had not grown garbanzos in the past but have some acreage this year. Given recent wet weather and relatively mild temperatures, there are three diseases for which we suggest keeping an eye out. Ascochyta blight (Ascochyta rabiei, Didymella rabiei) is a particular problem in garbanzo beans in wet years, like what we've been having this year. Ascochyta blight can occur at any stage of growth and on any aerial part of the plant. Brown lesions on the stems can cause damping-off symptoms in seedlings or can cause stems to break. At the advanced stage of the disease, concentric circles of spores will form within brown leaf lesions, and these are a good diagnostic characteristic (Figure 1). These concentric circles can also be seen on seed pods (Figure 2), which can result in poor seed set, seed discoloration, and shrinkage. If these beans are used for seed, subsequent crops can get infected. Management of Ascochyta is through the use of tolerant varieties, crop rotations, certified disease-free seed, always using a seed treatment (Mertect), and foliar fungicides. Foliar fungicides, such as Headline or Quadris, should be applied at the first sign of the disease and reapplied if rainy weather is forecasted. 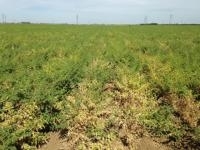 Alfalfa mosaic virus is another disease that could infect garbanzo beans. Alfalfa mosaic virus has a wide host range and is transmitted by aphids. Different strains of the virus may cause symptoms as varied as necrotic spots on leaves to yellow dots or mottling on the entire plant, which can stunt plants or result in pod distortion. Treatment is not recommended for either alfalfa mosaic virus or for the aphids that vector it. Aphids may taste the garbanzo plants but are either killed or deterred by the acidic exudate of the plant, so it is not economical to treat for them. Instead, planting date is important to avoid aphid flights. There are no patterns of infection in fields. Infected aphids land on plants, transmit the disease and then die, so healthy and dying plants may be next to each other (Figure 3). Lastly, white mold (Sclerotinia sclerotiorum and S. trifoliorum) may be a problem in garbanzos this year, like Ascochyta blight, because of the wet conditions. 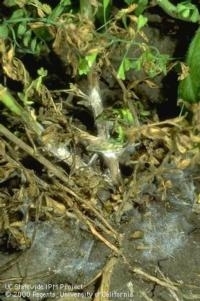 White mold may appear as a watery rot on stems, leaves, and pods. White mycelium may grow on the stem near the soil line where conditions are moist (Figure 4). Yellow flagging of leaf tissue may appear where stems have been killed. The fungus spreads under moderate temperatures and especially where canopies are dense. Management is through rotations with non-host crops (small grains, corn), and by applying fungicides, such as Endura, during the flowering stage. Information on products and practices is for educational purposes only and does not constitute an endorsement or recommendation by the University of California.